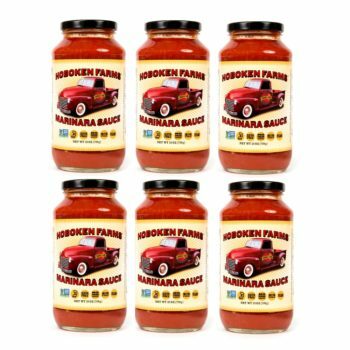 This is for six (6) jars of our famous Hoboken Farms Vodka Sauce. 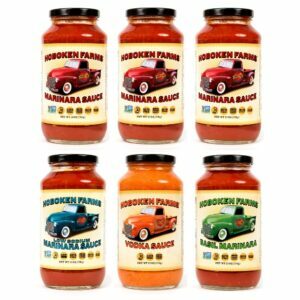 It’s all natural, gluten free with no preservatives. Plum tomatoes and heavy cream make this the most glorious vodka sauce in the ever lovin’ universe! Want more? Now you can save $10 on each additional 6 Pack you order of the same flavor or variety pack! Increase the number in the quantity field and we’ll automatically recalculate your additional discount! 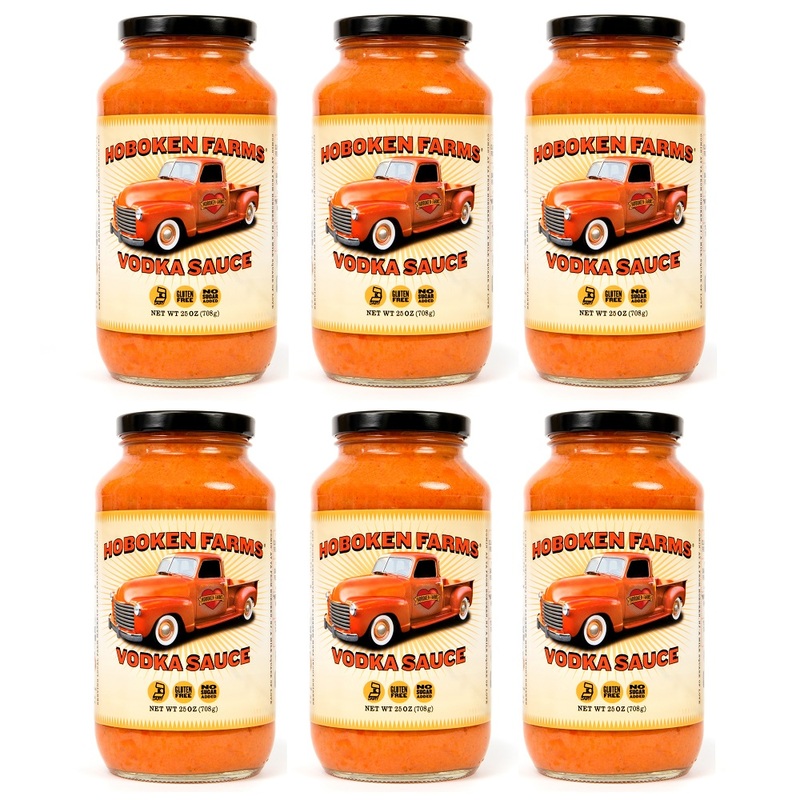 Locally made, micro batch, our Hoboken Farms Vodka Sauce is all natural, gluten free with no preservatives. 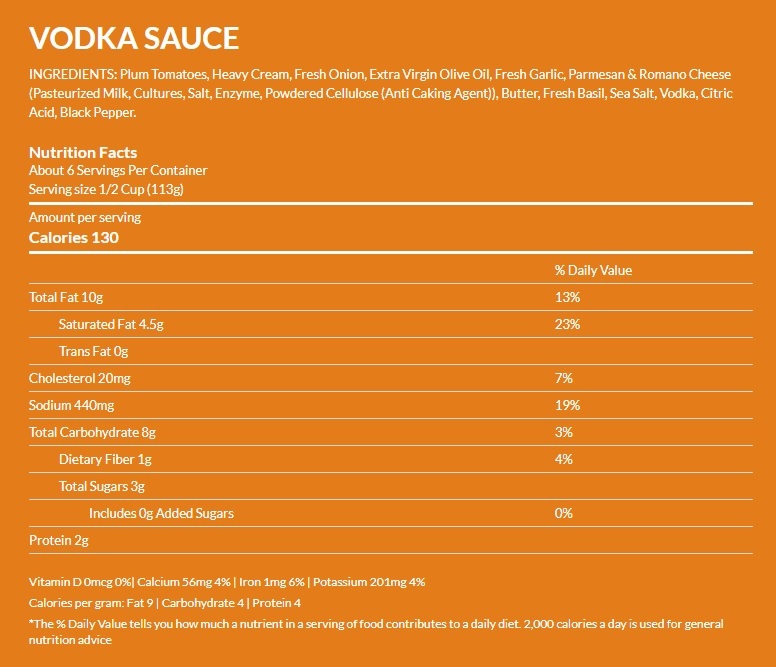 Plum tomatoes and heavy cream make this most glorious vodka sauce in the ever lovin’ universe! A True Hoboken Story: at a quaint sidewalk cafe on Church Square Park, sat a beautiful girl. 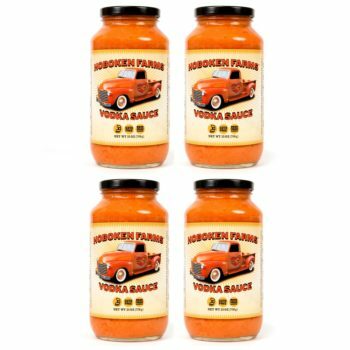 Once a week her favorite indulgence was the chef’s famous penne with vodka sauce. His recipe’s scientific secret was a splash of vodka that released a FLAVOR BURST from the farm fresh tomatoes and sweet heavy cream. She dunked a warm brick oven baguette into her plate of luscious sauce. The smile on the girl’s face lit up like the orange sky. It’s “SAUCE-UM!” she laughed. This is that sauce, enjoy! INGREDIENTS: Plum Tomatoes, Heavy Cream, Fresh Onion, Extra Virgin Olive Oil, Fresh Garlic, Parmesan & Romano Cheese (Pasteurized Milk, Cultures, Salt, Enzyme, Powdered Cellulose (Anti Caking Agent)), Butter, Fresh Basil, Sea Salt, Vodka, Citric Acid, Black Pepper.